The former Caley right back scored the winner against Celtic in the 2015 semi-final when he steered the ball in from a tight angle with just three minutes of extra time remaining. 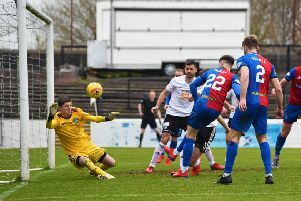 The dramatic 3-2 win took Inverness, then in the Ladbrokes Premiership and managed by John Hughes, through to their first Scottish Cup final, where they lifted the trophy after a 2-1 victory over Falkirk. Raven admits the euphoria he felt when scoring at the national stadium “will probably never be matched again in my life”. 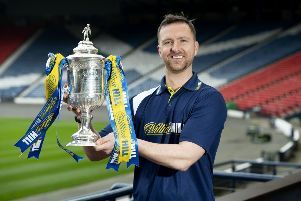 And with his previous cup exploits in mind, the defender believes John Robertson’s Championship side are “without a doubt” capable of beating their Premiership opponents at Hampden Park to get the chance to play either Aberdeen or Celtic in the final next month. The former Carlisle, Shrewsbury and Tranmere player, who missed the final through injury, said: “You can beat anyone on your day. “Inverness must be buzzing to have avoided Celtic and Aberdeen. Hearts are one of the big boys but they will be happy with that draw. “They will be the happiest of the four. They will be really looking forward to it. “The pressure is on Hearts. They are expected to win, so Inverness can go and play without any fear whatsoever. Inverness’s Scottish Cup final win – the first major trophy for the club which was formed in 1994 – capped off a remarkable season in which they finished third in the Premiership behind Celtic and Aberdeen, with a Europa League place secured. Merseyside-born Raven was grateful that Hughes gave his players the licence to express themselves, demonstrated perfectly when left back Graeme Shinnie teed up his opposite full-back for the dramatic winner against Celtic. “We were encouraged to play like that,” said the 34-year-old, now playing part-time football with Warrington Town in the Premier Division of the Northern Premier League, while coaching youngsters at Ellesmere College Academy.